A sporty raincoat for active dogs in cold and wet weather conditions. 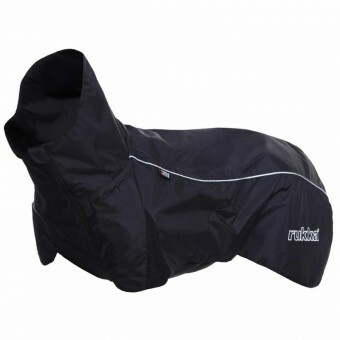 The warming and anti-static Pritex lining and fully taped waterproof fabric protect the dog from the cold and rain. The coat’s front panel and side gussets are made of comfortable and elastic tricot material. The elastic material together with the front cut improve the coat’s wear comfort and make it exceptionally well-fitting. Thanks to the zip closure on the collar, the coat is fast and easy to put on. The coat has an adjustable elastic band at the waist and handy quick buckle closures on both sides of the hem. A high collar to protect the neck and ears from the wind. Elastic rear leg straps ensure that the coat stays in place in all conditions, also in activities of higher intensity. The coat has reflective piping on both sides.